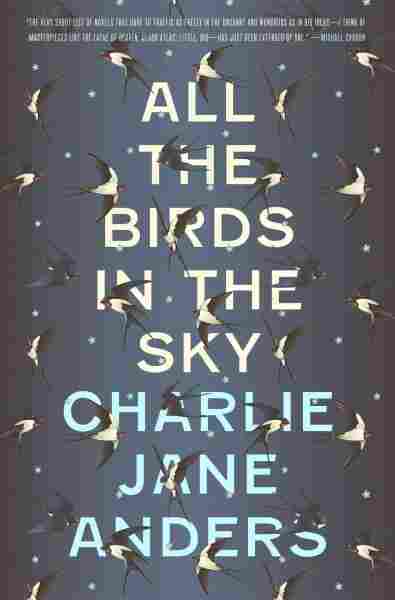 Book Review: 'All The Birds In The Sky', By Charlie Jane Anders Charlie Jane Anders' debut novel follows a girl with magical powers and a technically brilliant boy, uneasy friends since childhood, who get caught up in an apocalyptic war between science and magic. As a genre, science-fantasy is often as basic as it sounds: People with swords meet people with lasers. (In some cases, like Star Wars, the swords and lasers are even the same thing.) But there's so much more potential in the overlap between science fiction and fantasy, a fact that's not lost on Charlie Jane Anders. The editor-in-chief of Gawker's popular geek-culture website io9, Anders has been writing with passion and insight about science fiction and fantasy for years — so it only makes sense that in her debut novel for adults, All the Birds in the Sky, she's melded the two genres in a way that opens a profound, poetic new perspective on each. Patricia Delfine and Laurence Armstead are misfit kids — one dreamy, the other nerdy — who grow close to each other at school, only to see their friendship preempted by the usual demands of family, academia, and the eternal adolescent dilemma of finding oneself. But something far more staggering underpins the growing gulf between them: Patricia is a witch who can practice magic and speak with birds, while Laurence is a tech wunderkind who's invented a time machine that can jump him two seconds into the future. All the Birds performs its own kind of time travel. The story jumps ahead — first seven years, then 10 — until Patricia and Laurence are young adults, recently reunited after years of estrangement. In an indeterminate, near-future setting, the two rekindle their friendship, and perhaps something more, against a harrowing backdrop. Global catastrophes are brewing, and both Patricia and Laurence harbor secrets — one magical, one scientific — that hark back to Theodolphus Rose, a mysterious man who once posed as their high-school guidance counselor, and who seemed eager to pit the young friends against each other. The book is full of quirkiness and playful detail — it's not hard to imagine Wes Anderson adapting it, if he ever turned toward science fiction — but there's an overwhelming depth and poignancy to its virtuoso ending. With the world at stake, the book's protagonists grasp desperately for a way to apply their respective powers. But are they for good or ill? Huge questions of ethics and responsibility play into the plot as the apocalypse looms — conundrums that Anders raises with sensitivity, complexity, and a keen eye for the philosophical issues the human race faces as it ventures further into the future. There aren't any swords or lasers in All the Birds in the Sky, but other tropes abound. From robot fashion models to hacked smart devices to Red Dwarf marathons, All the Birds revels in geekdom. In that sense — as well as its fixation on post-adolescent angst meets inhuman ability — it's a lot like Lev Grossman's The Magicians. Where The Magicians works in darkness and cynicism, though, All the Birds paints in vibrant hues. Anders' characters sparkle, and even her grimmest observations about human destiny are leavened with hope. The book is full of quirkiness and playful detail — it's not hard to imagine Wes Anderson adapting it, if he ever turned toward science fiction — but there's an overwhelming depth and poignancy to its virtuoso ending, which tugs all of its rich cultural symbolism into a heart-wrenching whole. With All the Birds in the Sky, Anders has given us a fresh set of literary signposts — and a new bundle of emotional metaphors — for the 21st century, replacing the so many of the tired old ones. Oh, and she's gently overturned genre fiction along the way.